Since our last post the work on Achernar has continued. 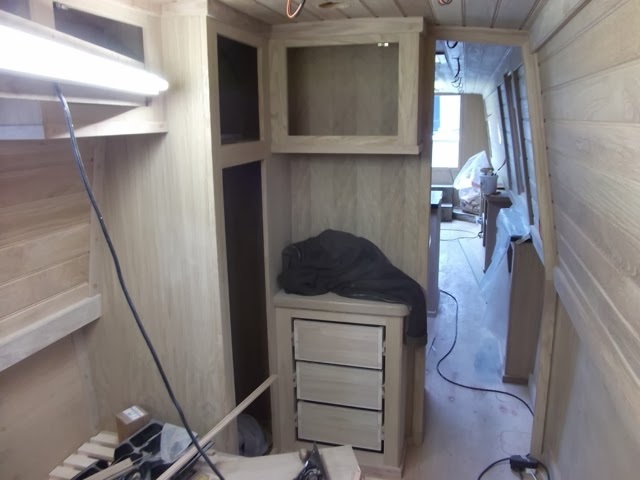 Although progress has appeared slow limiting photo opportunities the carpenter has been working on all the intricate details that will go a long way to making the finish so special. We also suffered the loss of our big softy Dylan. This came as a massive shock just before Christmas when he was diagnosed with suffering from kidney failure. Despite the best efforts of some specialist vets he could not be saved. Dylan was only 3 years old and our plans on living on the canals when our boat was finished involved him and we know he would have loved it from the way he enjoyed our canal holiday last year. So back to the build. 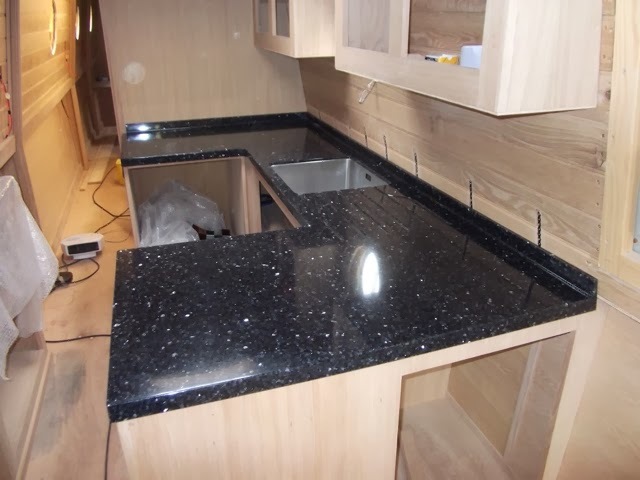 A visit to Hudson's last week was the first opportunity to see the Avonite worktops installed. Waiting for these to be fitted has slowed down the completion of the woodwork but Steve would only allow the Avonite suppliers to fit it when it was perfect. The Avonite is the Argent pattern with the high gloss finish. It still requires the tap holes and hob cutout to be done but the builder likes to do this. As stated in a previous post we have opted for a full sized oven and to allow this to fit in we had the length of the worktop reduced from its normal dimensions by approx 100 mm. 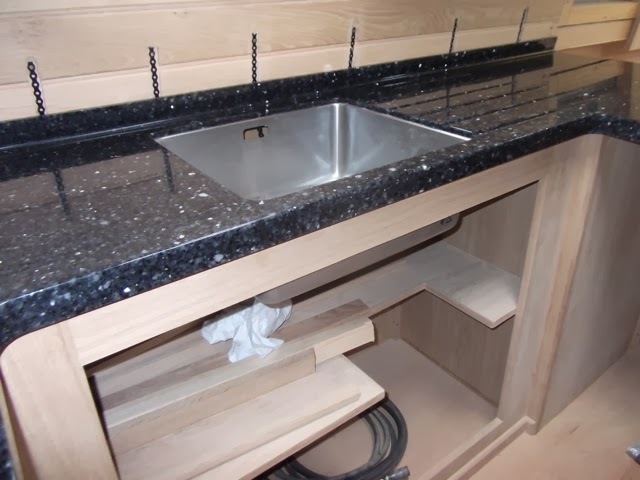 This has had the effect of creating a slightly larger area to stand and work in but we were unsure how the sink would fit. 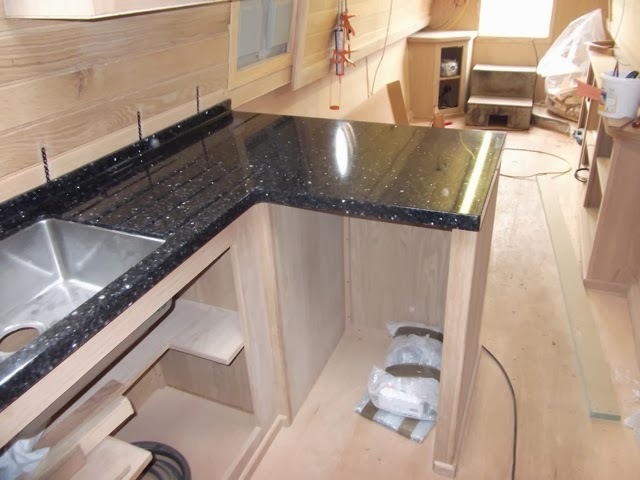 As can be seen the sink is still full sized and fits in well the only compromise is that the taps when fitted will be offset to the top right corner. On the left will be the faucet for our Seagul water purifier. All the doors will be made in the workshop and will be installed after the varnishing is completed. We also specified a chest of drawers beneath the dressing table in the bedroom. The draw carcasses have been made and look to be very solid. 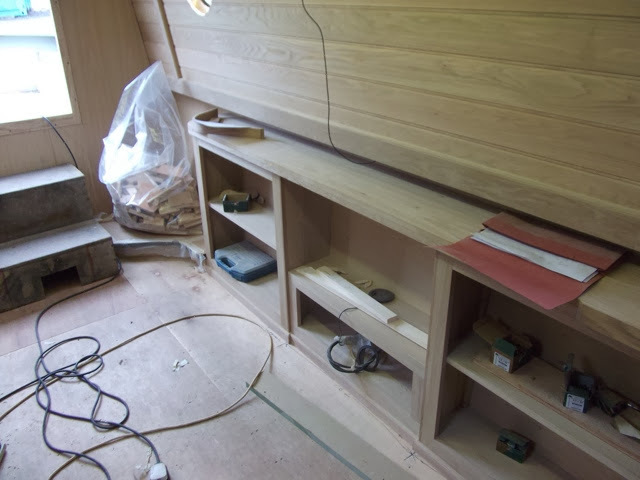 This is cabinet area where the tv will be housed. Either side of the tv will be cupboards and to the left is the hearth for the solid fuel stove. 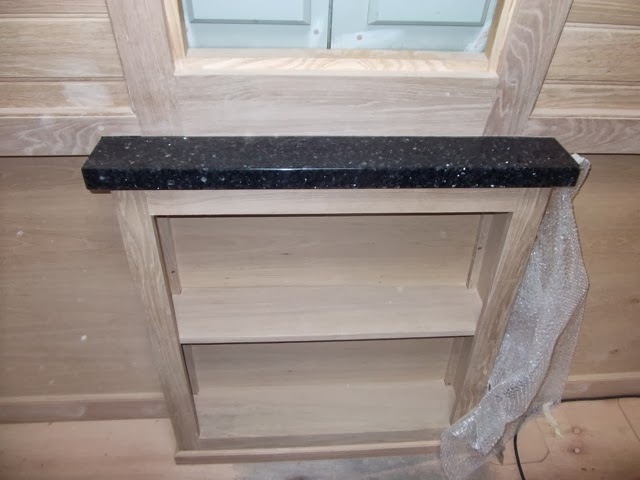 This hearth is a black granite L shape to include an area for a coal bucket. The other news we received is that Hudson's want to display our boat at the Crick boat show. We are happy for him to do this and almost confirms for us when the build will be finished. We know that Steve looks after boats he takes to the show and if people had not allowed this before we would not have been able to make the informed choices we have. Finally this is Oscar. 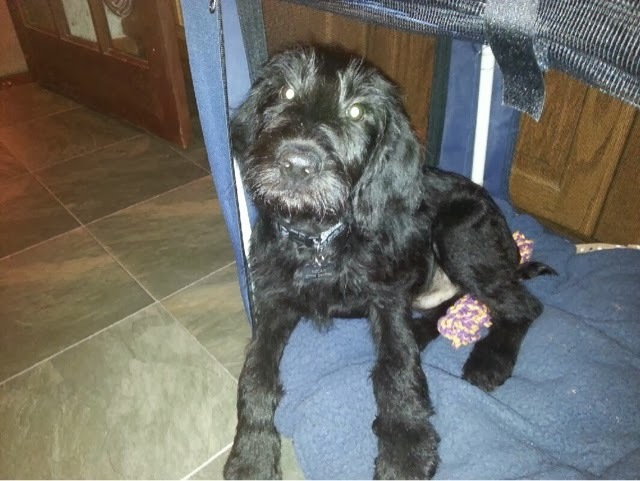 A 14 week old labradoodle who is our new addition. 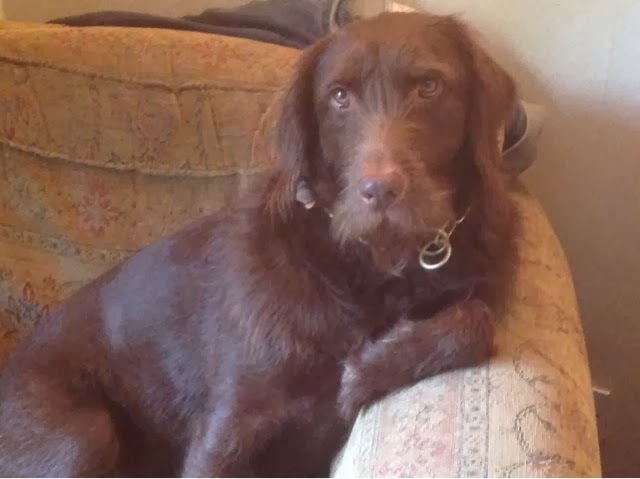 He is already settling in to family life and in the short time we have had him he has shown himself to be very intelligent.